"The Tick Tock Traps of the Time Commander!" So guess what I found, everyone? As much as today's comics are rightfully lambasted for their persistent sexist under(and sometimes over-)tones, it speaks rather glowingly of social progress that even the openly misogynist comics fans (and creators) of today would probably shudder at some of the works of yesteryear. As none of the comics on that list appear to be inhabitants of scans_daily (this edition, at least; some of them had probably been posted before the Great Crash), I have taken it upon myself to torture entertain you all with them. First up... The Brave and the Bold #63 by one Mr. Bob Haney, creator of the Teen Titans, technical creator of Wonder Girl, and one of the most batshit insane writers of the Silver/Bronze age. I can't be certain, but I think this was the first meeting between Supergirl and Wonder Woman (this was before The Brave and the Bold turned into Batman and His Amazing Friends); if true, both "Super-chicks" have my deepest sympathies. Worse, the cover is an insidious little piece: 100% accurate to the story, 0% indicative of the shitstorm of sexism we're all in for. We all know that Batman hates rock & roll, but what music does he like? Apparently, disco. Teen Titans #38 - "Through These Doors Pass the Bravest Titans of Them All"
Was cleaning up a closet last weekend and came upon my cache of original Teen Titans floppies. Here's a little treat from 1972, "Through These Doors Pass the Bravest Titans of Them All," or as I like to think of it, "That time Donna shaved her head and crossdressed for justice!" I've got six pages of an 18-page story, and therefore am cutting the Mal sequence down to a mere preview image. That's Mal having a flashback to a childhood beat-down, to explain his heretofore unheard-of fear of wide open spaces, which he must overcome in order to repair a lunar landing guidance module. So there you go - not bad for an ish where nobody even makes it into costume! Current Music: the Doors, "Light My Fire"
The Modern Monte Cristo...or is it? 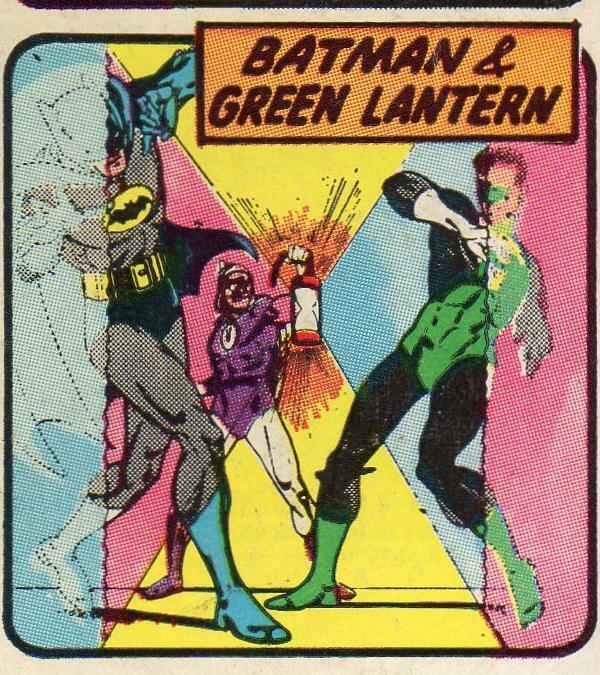 As threatened, here's the story behind the recently posted panel where Green Lantern is "energizing" Batman. From "The Brave and the Bold" #112, but reprinted from an earlier issue, here are 8 1/3 pages of 24 of "The Tick-Tock Traps of the Time Commander." This story is also notable for being the first Batman team-up in The Brave and the Bold, before he took over the book entirely. It takes place before the Justice League members trusted each other with their secret identities. Jokers and jokesters, you know what to do here. Two-Face Tuesday: a Bronze Age gem with Bats and Ollie in "Double Your Money... and Die!" One of my favorite Two-Face stories barely features the character at all. But much like Orson Welles's Harry Lime, whose five minutes of screen time dominated the whole of The Third Man, the threat of Harvey Dent looms throughout the Batman/Green Arrow team-up story from 1973's The Brave and the Bold #106. 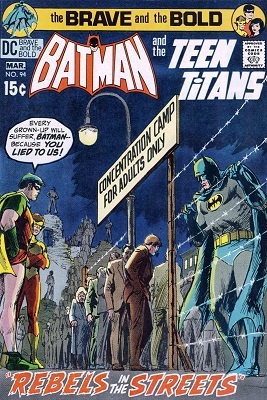 Written by Bob Haney and drawn by the great Jim Aparo (who got top billing! ), "Double Your Money... and Die!" was the second story to feature Harvey since Denny O'Neil dusted off the character after seventeen years in obscurity. It's pure Bronze Age Batman, too: a murder mystery filled with action and intrigue, building up to an epic ski chase in Switzerland. Plus it's fun, thanks the humor both intentional (Ollie's wisecracks) and unintentional (dated lingo, clothes, Batman uttering "Ye gods! ", etc). Told in one single issue, the story was so densely packed that DC actually sacrificed the letters column to let it run twenty-three and one-third pages instead of the standard twenty-two! Either they really wanted to do justice to Haney and Aparo's story, or they wanted avoid printing the letters for issue #103. Either way, Haney and Aparo make use of every single panel, and modern comic creators would do well to follow the economy of Bronze Age writers like Haney. 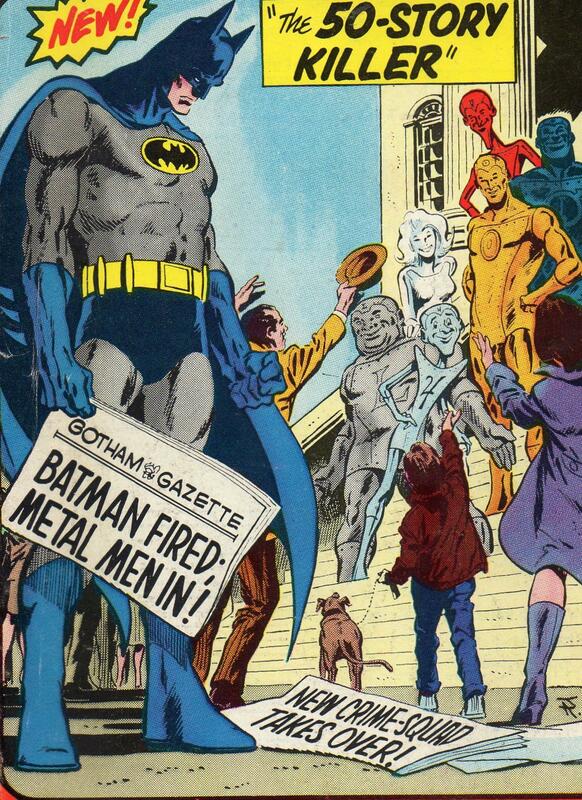 Also, Jim Aparo. It's Jim Aparo drawing Batman. On skis, no less! If you'd like to read this story in whole (which I recommend, as there's much more I had to cut), it's collected in the black and white collection, Showcase Presents the Brave and the Bold: The Batman Team-Ups, volume two, appropriately enough! From The Brave and the Bold #113, June-July #1974 "The 50-Story Killer!" 5 pages of 20. DC Comics' First Magical Girl! Current Music: "NBC University Theater: Peter Ibbertson"
Guess who's making an appearance in the Brave and the Bold cartoon? 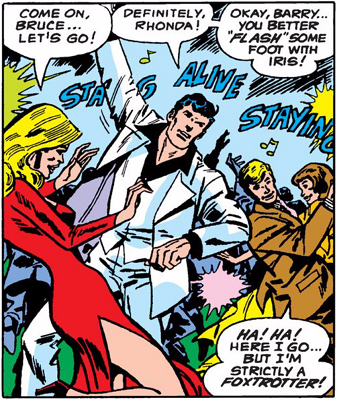 The Teen Titans vs some "Rock Band Criminals"
... yep. More music, a weird rock band, 'hip language' and some things that just don't work that way behind the cut. The first incarnation of the Teen Titans debuted in The Brave and The Bold #54 (1964), though they weren't named TT and Wonder Girl wasn't in sight yet. It was surprisingly difficult to choose the pages and I wanted to cover the complete issue, so I'll just try to summarize what happens between the single pages. Another thing I posted back in the day...The Teen Titans Lost Annual. It's 64 pages, yo, and every one of them is full of CRACK..
Christmas came early at my house - my long-awaited commission piece from George Perez arrived in the mail today! And thanks to my lovely little scanner, I'm passing the ho-ho-ho's on to you, dear scans_daily! And just in case that's not enough for a valid post, I give you one scan of Donna Troy in the world's skimpiest Santa suit. Have a very merry whatever you celebrate, gang! Before There Was Scans Daily, There Was...the Menomonee Falls Gazette #2, 1971. A Sampling. Would you like to see Wonder Girl and Wally West Beat Up Batman? ETA: A forgotten phone usage panel. A very special private phone.